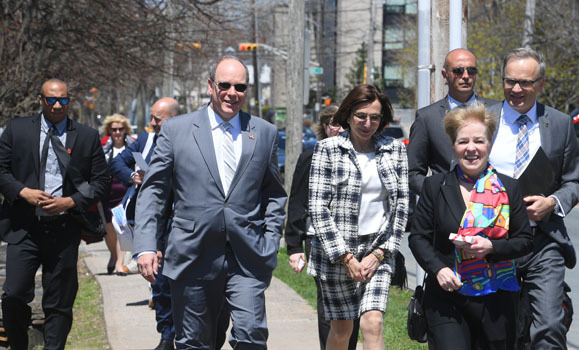 His Serene Highness (HSH) Prince Albert II, reigning monarch of the Principality of Monaco, spent most of Tuesday, May 8 at the Dal-led Ocean Frontier Institute (OFI), learning about its success in advancing the sustainable development of the North Atlantic. A guest of the OFI and its CEO, Wendy Watson-Wright, Prince Albert — the son of Hollywood glamour icon Grace Kelly and Prince Rainier III — met researchers like Megan Bailey (assistant professor, Marine Affairs) who talked about her work to develop an ecosystem indicator framework for the North Atlantic. She also made a big impression by serving Prince Albert sustainably-caught — and home-cooked — seafood. In addition, His Serene Highness toured ocean laboratories and took part in an informal public Q&A discussion about the changing ocean, together with Dal President Richard Florizone and Wendy Watson-Wright, CEO of OFI. 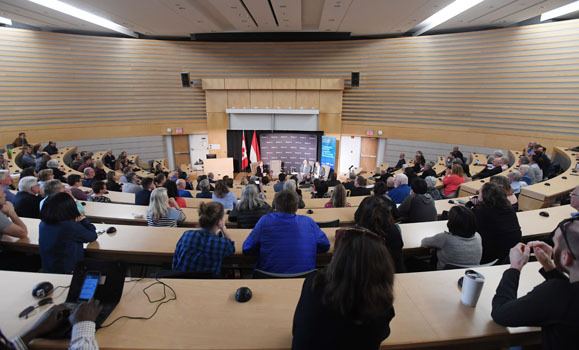 A crowd of about 250 people gathered in the Scotiabank Auditorium to talk about solutions for our ocean that would generate both environmental benefits and economic opportunity. 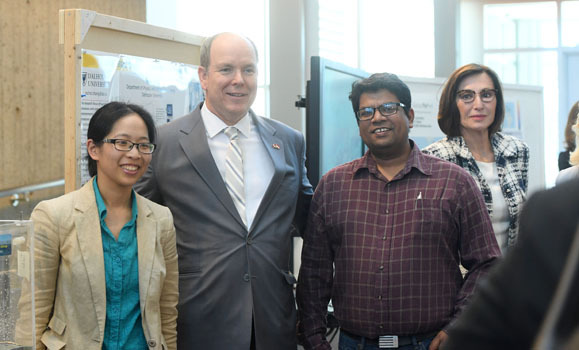 It’s not a surprising topic of interest for Prince Albert, who has shown global leadership in addressing environmental issues and promoting ocean-related sustainable development. The Prince Albert II of Monaco Foundation focuses on three main challenges: climate change and renewable energy development, combating the loss of biodiversity, and improving universal access to clean water. 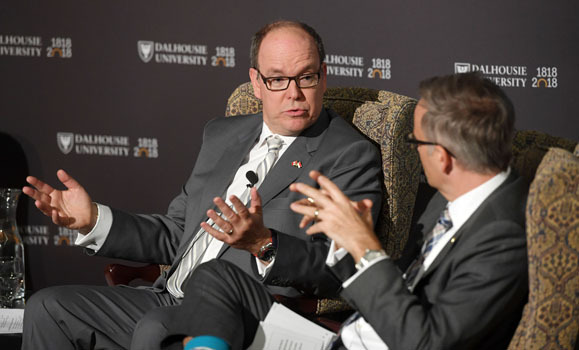 President Florizone said the timing of the Prince’s visit during Dal’s 200th anniversary year is fitting, given the university’s long legacy of research and community leadership focused on the global ocean. “Having His Serene Highness here to discuss the responsible development of our ocean resources is a wonderful opportunity. We were thrilled to share the positive impacts Dalhousie is making through our ocean partnerships,” he said. HSH is head of the princely house of Grimaldi in Monaco. His work on environmental issues — advocating alternative energy and hybrid vehicles — earned him the honour of being named a “Champion of the Earth” by the United Nation’s environmental program in 2008. In 2015, HSH was also recognized by the United Nations Correspondents Association for his efforts on behalf of biodiversity and climate-change research. Established in 2016 through a multi-year, $227 million public-private sector partnership led by Dalhousie University, Memorial University of Newfoundland and the University of Prince Edward Island, OFI represents an historic investment in Canadian ocean research. Learn more at OFI’s website.